Lateral approach spine surgery provides effective interbody stabilization, and correction and indirect neural decompression with minimal-incision and less invasive surgery compared with conventional open anterior lumbar fusion. It may also avoid the trauma to paraspinal muscles or facet joints found with transforaminal lumbar interbody fusion and posterior lumbar interbody fusion. However, because lateral approach surgery is fundamentally retroperitoneal approach surgery, it carries potential risk to intra- and retroperitoneal structures, as seen in a conventional open anterior approach. There is an innovative lateral approach technique that reveals different anatomical views; however, it requires reconsideration of the traditional surgical anatomy in more detail than a traditional open anterior approach. The retroperitoneum is the compartmentalized space bounded anteriorly by the posterior parietal peritoneum and posteriorly by the transversalis fascia. The retroperitoneum is divided into three compartments by fascial planes: anterior and posterior pararenal spaces and the perirenal space. Lateral approach surgery requires mobilization of the peritoneum and its content and accurate exposure to the posterior pararenal space. 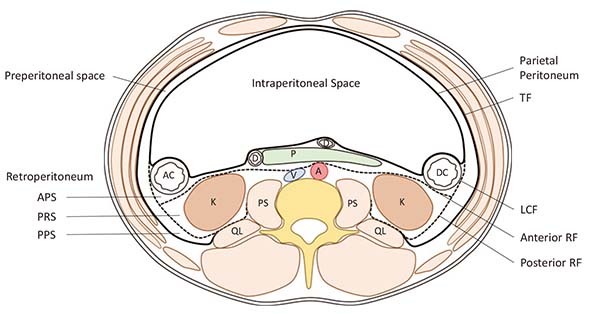 The posterior pararenal space is confined anteriorly by the posterior renal fascia, anteromedially by the lateroconal fascia, and posteriorly by the transversalis fascia. The posterior renal fascia, the lateroconal fascia or the peritoneum should be detached from the transversalis fascia and the psoas fascia to allow exposure to the posterior pararenal space. The posterior pararenal space, however, does not allow a clear view and identification of these fasciae as this relationship is variable and the medial extent of the posterior pararenal space varies among patients. Correct anatomical recognition of the retroperitoneum is essential to success in lateral approach surgery. Spine surgeons must be aware that the retroperitoneal membrane and fascia is multilayered and more complex than is commonly understood. Preoperative abdominal images would facilitate more efficient surgical considerations of retroperitoneal membrane and fascia in lateral approach surgery. © 2017 The Japanese Society for Spine Surgery and Related Research. CC BY-NC-ND 4.0 (https://creativecommons.org/licenses/by-nc-nd/4.0/).